Castlebar (Irish: Caisleán an Bharraigh, meaning "Barry's Castle") is the county town of County Mayo, Ireland. It is the largest town in County Mayo. A campus of Galway-Mayo Institute of Technology and the Country Life section of the National Museum of Ireland are two important local amenities. The town is linked by railway to Dublin, Westport and Ballina. The main route by road is the N5. Its economy is primarily service-based. The modern town grew up as a settlement around the de Barry castle, which was built by a Norman adventurer in 1235 and was later the site of an English garrison. 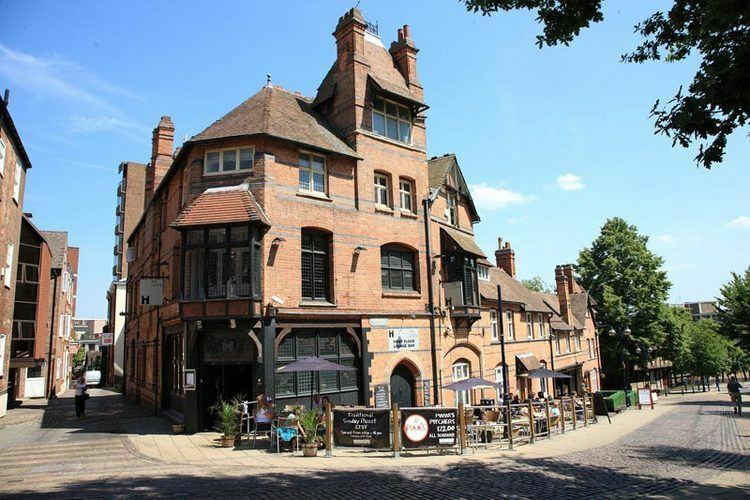 The castle was located at the end of Castle Street, where the town river is thought to have originally flowed. Castlebar Barracks operated in the town for many years: it was finally closed in March 2012 and the buildings and grounds have been purchased by the local town and county councils. Armed conflict has been the centrepiece of the town's historical heritage. French forces under the command of General Humbert aided in a rout of the British garrison in the town during the failed Irish Rebellion of 1798, which was so comprehensive it would later be known as "The Races of Castlebar". A short-lived provisional Irish Republic had been declared upon General Humbert's arrival at Killala. Following the victory at Castlebar John Moore, head of the Mayo United Irishmen and the brother of a local landowner, was declared president of the Province of Connacht. His remains are today interred in a corner of the town green, known as the Mall, previously the cricket grounds of Lord Lucan, whose family (the Binghams) have owned and still own large tracts of the town and county. The town received its charter from King James I in 1613, and is today governed by an urban district council, a subdivision of Mayo County Council. The Lake in Castlebar is also known as Lough Lannagh. The Irish National Land League was founded by Michael Davitt, of Straide in County Mayo, at the Imperial Hotel in Castlebar on 21 October 1879. The name of the town comes from the castle built in 1235 (see above). This castle is depicted in the top of the crest, with two yew trees on either side because Castlebar is the county town of Mayo (Irish: Maigh Eo, meaning "plain of the yew trees"). The castle ruins still remain. The crosses represent the parish of Aglish (the official name of the parish of Castlebar). The 1798 'Races of Castlebar' is commemorated with the Pikes in the top left-hand corner. Underneath, the words 'Ar Aghaidh' can be found, which means 'Forward'. Castlebar expanded rapidly during the 1980s, 1990s and 2000s. Castlebar's population boomed in the late 1990s, rising by one-third in six years, though this growth has slowed in recent years. According to the 2011 Census it stands at 10,826 inside urban boundaries and 12,318 with environs. By comparison, in 1926 the population of Castlebar was 4,256. Castlebar is the location for important festivals and traditions, among which is the International Four Days' Walk. A well-established blues music festival in venues across the town took place for many years on the weekend before the first Monday in June, but has not taken place since 2011. During the 1970s and 1980s the town hosted the International Castlebar Song Contest which was televised nationally on RTÉ. The Museum of Country Life is located on the outskirts of Castlebar, and is the only branch of the National Museum of Ireland located outside Dublin. Castlebar is home to The Linenhall Arts Centre, which exhibits visual art throughout the year, as well as hosting live drama and music performances. The Linenhall also organises an annual children's arts festival called Roola Boola (an anglicisation of the Irish phrase rí rá agus ruaile buaile which in this context means "boisterous fun"). The Royal Theatre and Event Centre, with a capacity of two thousand two hundred fully seated, four thousand standing, hosts larger-scale productions and popular music concerts. There are Roman Catholic, Church of Ireland (Anglican), Elim Pentecostal, and evangelical (Calvary Church Castlebar) churches in the town. There are also several Spiritualist gatherings. There is a recently established Mayo male voice choir and Mayo Concert Orchestra. 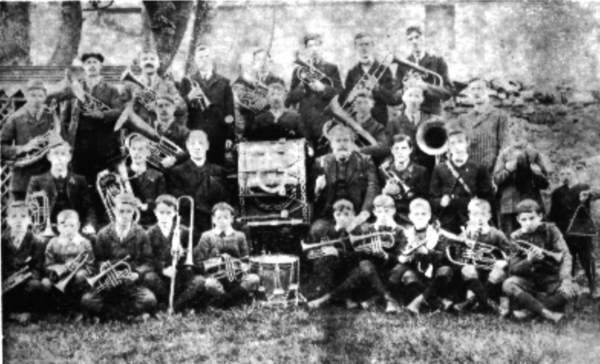 There is also a marching band in the town – one of the few surviving marching bands west of the Shannon. Throughout the 1980s and 1990s, Castlebar experienced significant immigration, growth and investment. Castlebar has a selection of places to eat and drink. There is a broad range of types of food available: Italian, Indian, Chinese, Irish, and fast food, as well as cafes. A lot of the public houses closed during the building boom in the 1990s. In 1990, Castlebar had 54 licensed premises, although this number had fallen to fewer than 30 public houses by 2008. Castlebar is a garrison market town; there was a tradition of open air markets mostly selling livestock, which meant there was a healthy daytime drinking trade in Castlebar, but this has disappeared. For a combination of factors since the introduction of the smoking ban and the EU single payment grant to farmers, most public houses offer food to help subsidise the drop in alcohol sales. One of the oldest pubs in Castlebar is John McHale's pub, located on New Line. The pub is known for its sale of a Meejum of Guinness, which is slightly less than a pint. It once had 'the best pint of Guinness in Ireland' according to a national tabloid. Castlebar is traditionally a market town, and it is still a major destination for shoppers from all over the west of Ireland. It boasts an increasing number of national and international chain stores, and several new shopping areas have been developed in the past 10–12 years on what were considered the outskirts of the town. The modern shopping precinct along Hopkins Road is now the commercial heart of the town, surpassing Main Street. Stores include Argos, Tesco, Dunnes Stores, Aldi, Next, Lidl, Supervalu, Boots, TK Maxx, New Look, Shaws, Heatons, Elverys, Mr Price Branded Bargains and Penneys, as well as smaller names such as Paul Carthy menswear, Irwin Interiors and Liam Cannons Fruit & Veg. In January 2012 it was confirmed that Castlebar is the second largest retail centre in Connacht, after Galway city. It comes in ahead of Sligo. A survey by consultants Experian showed that €284 million is spent in by shoppers in Castlebar every year. The Irish Retail Centre Rankings show Castlebar is the 7th largest retail centre in Ireland (1 up from the previous survey) in terms of retail spend, and 12th on the island of Ireland. 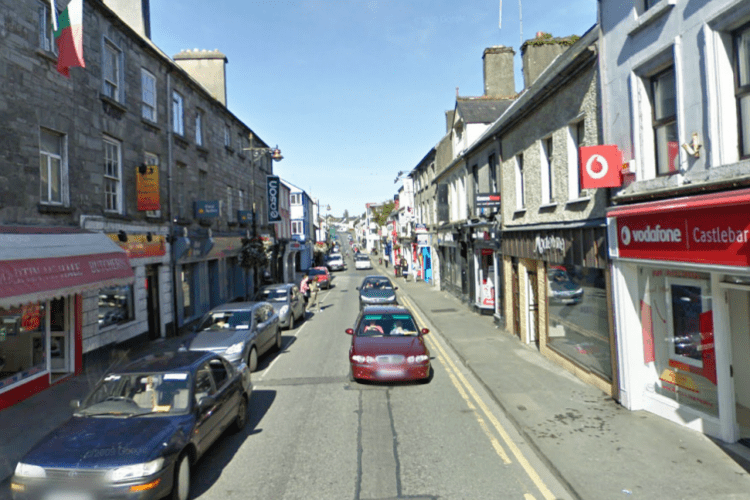 Castlebar is a served by the N5 national primary road and the N60 and N84 national secondary roads. In 1990 a relief road was built around Castlebar removing through traffic on the N5 from the main street. This road is a basic two-lane road. It suffers from chronic congestion, particularly in the summer months when thousands of tourists have to negotiate the bottleneck en route to neighbouring Westport and Achill Island. A bypass of Castlebar of dual-carriageway standard was approved by An Bórd Pleanala in July 2014, but construction has not yet started. The station opened on 17 December 1862. The local Gaelic football and hurling team is the Castlebar Mitchels GAA club. Throughout its history, the club has won 27 Mayo senior football championships and one Mayo senior hurling championship title. Castlebar Mitchels are second only to Ballina Stephenites in terms of the number of championships won. After a couple of years in the doldrums, the club regained its place amongst Mayo's elite senior football clubs in 2005. The club boasts a very strong youth football structure. On 17 March 2014, the club finished runners-up in The All Ireland football club championship. MacHale Park in Castlebar is one of the major GAA grounds in Ireland, with a capacity of 42,000. The Mayo County board has recently built a new stand with dressing rooms and offices underneath and plan to add fifteen extra rows of seating to the 'Albany' end. A press area and TV stand have been constructed on the MacHale Road side. Other nearby GAA clubs include Breaffy GAA, Parke GAA and Ballyvary Hurling Club. The local football team is Castlebar Celtic F.C. (est 1924), which currently has a team playing in the Mayo Super League and a senior women's side playing in the Continental Women's National League. There is also a thriving youth structure which provides teams from under 10s to under 18s for boys and under 14 to under 17 for girls, as well as an under 8 Academy. Since the introduction of schoolboy football, the club has seen unmatched success at every age at county, provincial and national level. They play their home games in Celtic Park, in the centre of the town. Their traditional strip is made up of green and white hoops, white shorts and white socks. Castlebar Town FC were formed in the 1970s (as Castlebar United) as an alternative to Celtic. Their strip is made up of black and white striped shirts, black shorts and black socks. Other notable local teams include Snugboro United (Yellow and Blue Strip), Ballyheane FC, Manulla FC (Blue and White or Green Strip) and Ballyvary Blue Bombers (Blue Strip). Castlebar RFC, a Rugby union club founded in the 1970s, is located at Cloondeash on the outskirts of the town. There are two pitches and a club house onsite, and the club actively participates in provincial (Connacht Junior League Div.1) and national league competitions. Castlebar won the Cawley Cup in 2009. The ladies team which was formed in 2012, won the Connacht Development League Final in November 2013. The Club plays in a navy and light blue strip. There is an 18-hole golf club in the town, as well as active basketball, racquetball, tennis and other clubs. The council provides an indoor heated swimming pool and there are numerous gyms. There are also several martial arts clubs teaching a variety of disciplines including Karate, Kickboxing, Savate, Krav Maga, Haedong Kumdo, Ninjitsu and Tai Chi. Over the years, Castlebar has hosted several major international Martial Arts seminars with instructors such as S. Kato Sensei (9th Dan Shotokan), T. Nagamine Hanshi-sei (10th Dan Matsubayashi-ryu), Kim Jeong Seong (9th Dan Haedong Kumdo) and Tommy Lawlor (15th dan Bujinkan Ninjutsu). Castlebar also played host to the WOMAA World Martial Games in both 2007 and 2008 which saw hundreds of competitors from all over the world competing over the three-day event. Ernie O'Malley (1897–1957), prominent officer in the Irish Republican Army during the Irish War of Independence and on the anti-Treaty side in the Irish Civil War; also a writer. William Joyce Sewell Unionist colonel during American Civil War. US senator from New Jersey.